The history of China goes back a long way, stretching nearly 5,000 years, from a time when history and mythology were regarded as one and the same, to the succession of numerous dynasties (and sometimes even overlapping ones), with occasional periods of warring states every so often. And there are many influential figures who have made their mark in Chinese history, heroes, tyrants, poets and philosophers, names which had made their way into the Chinese psyche and remained there ever since. With such a long chronology and such a large who’s who of Chinese history, it gets a bit daunting, or even outright confusing, when it comes to trying to remember which dynasty came first, or who’s from which period, who came earlier? Have you ever been accused of being ignorant of Chinese culture by having the various dynasties all mixed up? Or have you ever gotten too upset when you thought that someone was from one dynasty when in fact he belonged to another dynasty? So here I present a partial solution, a brief history of China, a timeline from (nearly) the very beginning all the way to the present, with the dates of certain historical figures indicated. I call it a partial solution, because anything more detailed or accurate is beyond the scope of my blog. For more information, you can search in wikipedia, or ask any of your friends whom you think is well-learned in Chinese history. I get a feeling that they may instead be the ones who will be asking you for information after you have read the timeline. Gee, wow. I hoped that worked. The Toy Seller is back! See ya at the Toy Outpost (PS) – ENDED and Thanks! Salut to all! 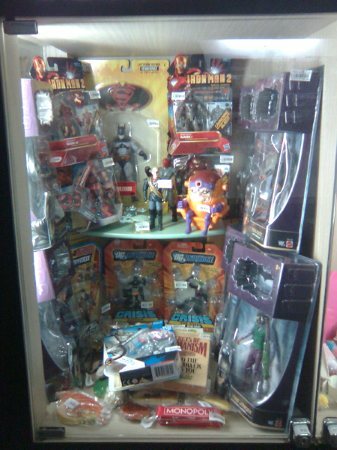 I have rented, for the month of June, a display locker at the Toy Outpost (Plaza Singapura branch) located at Level 7 of Plaza Singapura, to do a little toy business of my own. You can check out Locker 2I, where my sale items are on display.
. “Joker with missile” SOLD!!! – Iron Man 2 “Iron Man Mark I Armor” SOLD!!! – Iron Man 2 “Ivan ‘Whiplash’ Vanko” SOLD!!! – Marvel Universe “Silver Surfer” SOLD!!! – Marvel Universe “Daredevil” (First Appearance) SOLD!!! – Marvel Universe “Archangel” SOLD!!! – Marvel Universe “Juggernaut” SOLD!!! – Marvel Universe “Cyclops” SOLD!!! – Marvel Universe “Power Charge Rhino”, fierce foe of Spider-Man SOLD!!! – The evil “Red Skull”, from the 1990s Spider-Man animated series“ SOLD!!! – DC Infinite Heroes “Batman” SOLD!!! – DC Infinite Heroes “The Joker” (Black suit variant) SOLD!!! – DC Infinite Heroes “Two-Face” SOLD!!! – DC Infinite Heroes “Batwoman” SOLD!!! – DC Infinite Heroes “Black Hand” SOLD!!! – “General Chang” from Star Trek VI: The Undiscovered Country SOLD!! !